Arrival in Florence. You will be met and transfered to your hotel. In the afternoon, meet your tour guide at your hotel for a welcome briefing. Start your discovery of Florence with an orientation tour in the heart of town, passing along Pontevecchio and Piazza della Signoria. Overnight in Florence. Start your exploration of Florence from the unknown and most picturesque sides of the city: visit the market of San Lorenzo where it's possible to see the food arriving from the Tuscan countryside. It's a chance to taste lots of varieties of local cheeses, fruits, vegetable, and breads. If you"re still hungry, there's 􀀀free time for lunch. In the afternoon, meet your guide in the hotel and get ready to explore the heart of the town. Lorenzo de Medici transformed Florence into the cradle of the Renaissance by attracting the best artists, architects and writers of the time; Leonardo da Vinci, Michelangelo and Botticelli who he commissioned to produce various works of art and architecture. We'll visit Piazza della Signoria, walk by the Palazzo Vecchio, , the Duomo with Giotto's bell tower (from outside), Ponte Vecchio. Our walk through Florence will end with a, visit to the Accademia and experience the masterpiece of Michelangelo: the statue of David. Overnight in Florence. "Today visit two of the most beautiful towns in Tuscany: Siena and San Gimignano. Starting from Florence, you will arrive in Siena passing along the beautiful hills of Chianti. In the ancient times, there was only one city in Tuscany that competed against Florence for power, wealth and artistic beauties: Siena. Once in town, you will enjoy a guided walking tour to discover Piazza del Campo, stage of the famous Palio horse race, as well as exploring quieter backstreets. You will learn everything about the 17 medieval city districts that compete against each other in the Palio, called Contrade. Your journey continues to San Gimignano, celebrated for its medieval skyscrapers, high walls and narrow streets. According the legend the town was founded in 63 BC when two brothers Muzio and Silvio, young patricians fled from Rome because accomplices of Catiline, took refuge in Valdelsa but became rich and powerful only when it became an important stop along the Francigena Road, connecting Canterbury to the Holy Land, around year 1000 AC. After some free time in San Gimignano, gaze in awe at a marvellous sunset on the Tuscan hills and then enjoy a typical Tuscan dinner in the cellar of a fascinating noble Villa in the Chianti countryside. During your dinner you will also enjoy a wine tasting, pairing different wines with the various courses of your Tuscan meal. A Tuscan dessert is then served with local sweet wine. Coming back to Florence, you will stop at Piazzale Michelangelo belvedere, for a breathtaking view of Florence, admiring all the lights of the city." Day 04: Monday "La Villeggiatura". A relaxing day in the countryside with cooking class. In the Middle Age, Medici family invented the word 'villeggiatura' to celebrate the idea that one should take a rest from the crazy life of the city to respite in the rolling pastures and fortress-topped towns of Tuscany. The aristocats and the rich merchants starts to build their "villas" as well as agricultural farmhouses in the countryside around Florence and Siena for the pursuit of villeggiatura. Today, discover this ancient tradition and enjoy the fantastic experience of learning our Chef's secrets on Italian cooking in an intimate and friendly atmosphere immersed in the beauty of the Tuscan countryside. In the morning, take a little walk in the city center and visit Florence Farmers' Market and discover all its beautiful colors and authenticity, getting to know the butchers, bakers and farmers which Florentines buy their ingredients from. Later, reach a fascinating villa in the Chianti countryside where you will have the opportunity to learn about Tuscan food and prepare your dishes under the attentive guidance of an expert Chef. 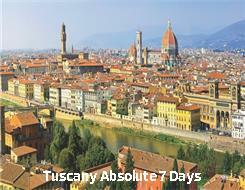 The experience include Lunch + Wine tasting of 3 wines and a visit of a boutique winery in Chianti. Return to Florence late afternoon and overnight. Departure from Florence. Upon arrival in Pienza free time to have a walk in the city centre. This charming village is widely known as the "ideal city of the Renaissance", the creation of the great humanist Enea Silvio Piccolomini who later became Pope Pius II. Piccolomini had the money and influence to transform his birthplace village, the humble Corsignano, into what he considered the Utopian city should be, exemplifying the principles and philosophy of classical times and of the great Italian Renaissance. Thus, Pienza became the realization of a dream! Departure for Montepulciano and guided visit of the city. Montepulciano, just eleven kilometres away from Pienza is nestled between the Val D'Orcia and Val di Chiana, is a quintessential Tuscan medieval village, boasting a green landscape of rolling hills, castle walls and ramparts, thermal springs and fine wine… just perfect! The city, full of elegant Renaissance palaces, ancient churches, charming squares and hidden corners, boasts vast panoramas all over the wonderful Val d'Orcia and Val di Chiana valleys that surround it. The town is also famous worldwide for its Vino Nobile, an Italian product par excellence. Besides the wine and other excellences of this town related to food, such as pici pasta, pork, lentils and so on, there are many things worth visiting here. You will have the chance to taste all these excellent things during your lunch that will be served in a local Trattoria, paired with a wine tasting.. At the end, continue to Cortona area where you will arrive late afternoon. After a long week in Tuscany, your Estate is the perfect spot to relax and recover energy. You can read your favourite book in the gorgeous garden, walking along the shady roads around your villa, enjoy a horse riding or visit the town of Cortona, just 10 min away. Among the many activities available, we suggest to have a cooking class with the resident chef. The cuisine of Tuscany stands out for its simplicity and sobriety which combines well with the refinement and attention for high quality local products. You can enjoy a class in a beautiful kitchen located in a evocative setting, where thanks to an experienced chef you will learn all the secrets of the traditional recipes. Tonite, enjoy a full dinner paired with Tuscan wines to say goodbye to Tuscany. Overnight near Cortona.